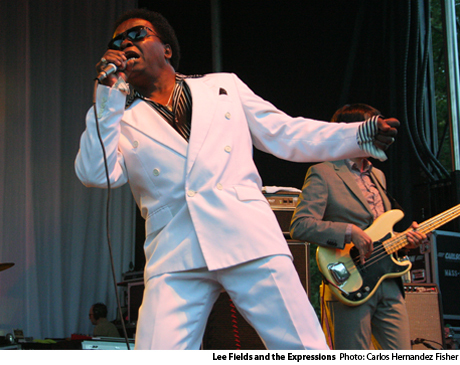 Lee Fields has the grunts, growls and snarls down, and the necessary confidence to pull off a blindingly white suite. When the iconic funk singer swaggered out after his three-minute-long intro from his backing band, the Expressions, there was a collective grin from the audience, like when Gene Wilder makes his grand entrance in Willy Wonka. Fields looks like the legend we've been waiting for. But a variety of insurmountable factors conspired against the group, which only highlighted weakness at the seams. Famed grungesters Mudhoney were playing on the adjacent stage, and while this hadn't been problem for other acts all weekend, Fields and co. didn't have the sound or stamina to drown out the competition. They also didn't have the audience, either, which was one of the smallest so far at this year's fest. And while Fields is a great showman, stomping and strutting and promising love to the ladies, the Expressions, ironically, conveyed little except mild boredom. If you look unaffected at your own funk-soul show, you're doing it wrong.